Norland Optical Adhesive 68 ("NOA68")is a clear, colorless, liquid photopolymer that will cure when exposed to ultraviolet light. Since it is a one part system and 100% solids ,it offers many advantages in bonding of optical materials where the bonding surface can be exposed to light. The use of NOA 68 eliminates premixing, drying and heat curing operations common to other optical adhesive systems. Curing time is remarkably fast, and is dependent upon the thickness applied and the amount of ultraviolet light energy available. NOA 68 is designed to give improved adhesion to many plastics such as acrylic, polycarbonate and cellulose acetate butyrate. In addition to plastics, NOA 68 has good adhesion to glass and metals and can be used to bond combinations of the three. Suggested uses for NOA 68 include bonding compound plastic lenses, laminating polarized film between glass or plastic, mounting plastic lenses in metal or plastic mounts and bonding cover glasses. The recommended energy to fully cure the NOA 68 is 4.5 Joules/sq. 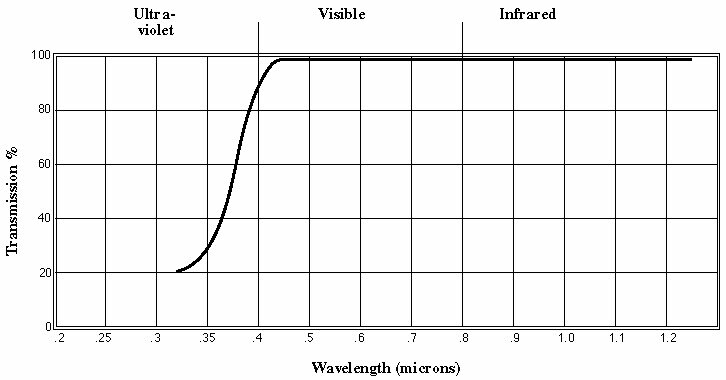 cm of long wavelength UV light with maximum absorption between 350-380 nanometers. Most glasses and many clear plastics will transmit light in this range, although some clear plastics contain UV absorbers. The absorbers will reduce or eliminate the UV light to slow down or prevent curing. Systems must be designed with at least one substrate transparent to the UV light in order to cure the adhesive. Some other light sources that can be used to cure the adhesive are sunlight, mercury lamps and fluorescent black lights. When fully cured, NOA 68 has very good adhesion and solvent resistance, but has not reached its optimum adhesion to glass. This will come with aging over a period of about 1 week, in which a chemical bond will form between the glass and adhesive. This optimum adhesion can also be obtained by aging at 50° C for 12 hours. After aging, glass bonds can withstand temperatures of -80 to 90° C while nonaged glass and plastic bonds will withstand temperatures from -15 to 60° C. In some cases, the adhesive will withstand temperatures to 125° C when used as a film or a coating depending upon the application. Shelf life of the liquid is a minimum of 4 months from the date of shipment, refer to the package label for the actual expiration date, if stored in a cool (5-22° C), dark place in the original container.. If refrigerated, allow the adhesive to come to room temperature prior to use.